“We’re just pals,” returns Lisa. Sam provocatively suggests Lisa hates Patrick’s girlfriend, and she leans forward, protesting. Patrick edges slightly away from Lisa, uncomfortable with this line of questioning, and admits that his girlfriend lives in another state. Sam’s dash-cam records Patrick and Lisa sorting through their romantic lives, and he captions it as friendzoning. Later, Sam posts the video to an online driver forum where a round of comments from fellow drivers follow. Some admire Sam for his entertaining videos, and others commiserate with being in the friendzone. When passengers take an Uber or a Lyft ride, they probably don’t expect that dash-cam footage of their conversations, antics, or bad behavior circulate in closed online forums, public groups, and on YouTube. Uber & Lyft drivers have lots of reasons to record. When passengers make false allegations against them, for example, they can pull up the footage and offer it in their defense. One driver claims that he was kicked off the Uber platform after his passengers wrongfully accused him of driving while impaired. 4 passengers entered his vehicle, and they tried to include a 5th, but the driver declined to take more passengers than he had seatbelts. In retaliation, the driver claims they falsely reported him to Uber for impaired driving. He posted video of the incident to YouTube. Drivers use dash-cam audio and video to hold passengers and Uber accountable for wages they’re owed, to justify their own actions, or to protest their innocence when they are wrongly accused of some ill. For example, one passenger scam is to start the trip, but cancel it mid-way, which effectively short-changes the driver. Although this can also be an accident — sometimes people press the wrong button — it’s common enough to be a well known problem that affects driver pay. 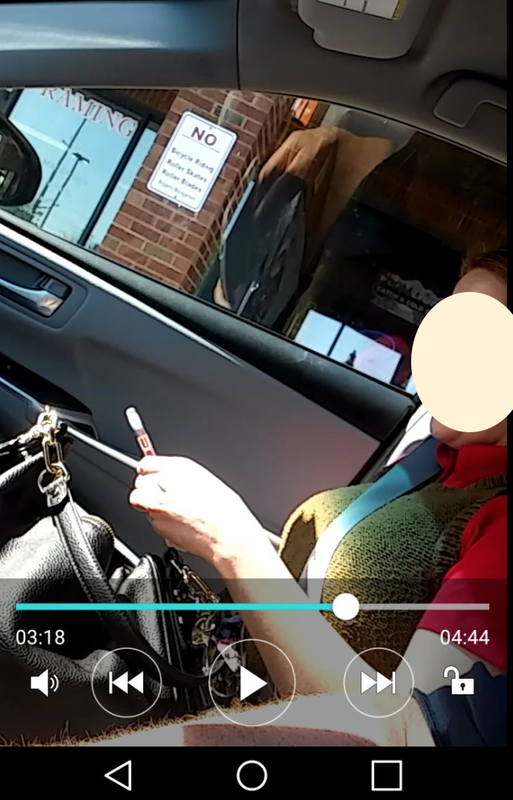 I blocked out her face, but it’s rare for passenger details to be blurred out, except on waybills. 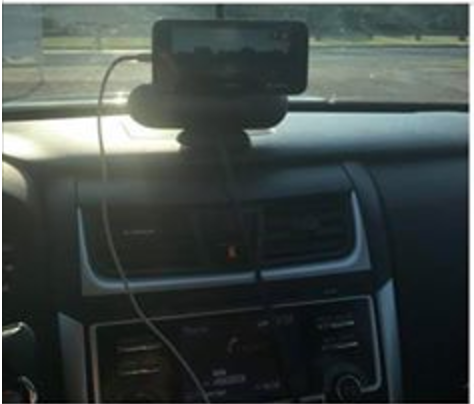 Tony’s dash-cam allegedly caught one passenger in the act, and he posted a photo of the accused passenger to a forum. (I blocked out her face with a handy oval). Typical Uber & Lyft passengers are probably unaware that every time they take a ride, they risk becoming a public spectacle. One photo I saw recently displays a husky male passenger clutching a small dog, which he claimed was a service dog, according to Paul, the driver. Paul questioned the dog’s credentials and asked the passenger a few Qs he expected any service dog owner to answer, to no avail. Drivers are legally obliged to accommodate service dogs, but passengers will sometimes try to scam them with their non-service pets. 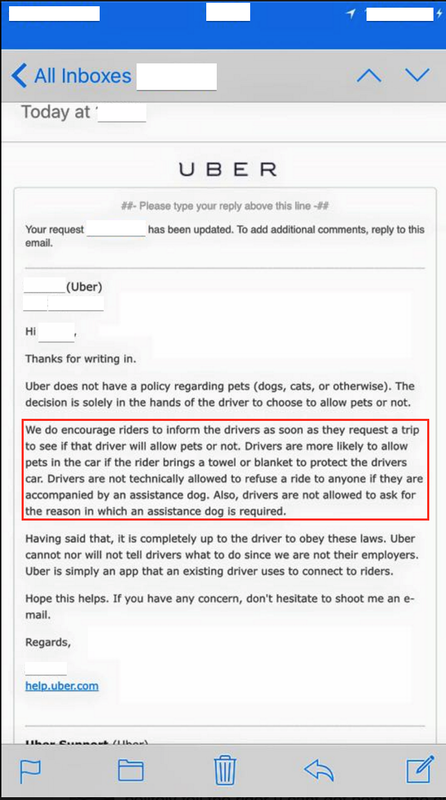 Here’s a message a driver received from Uber regarding service pets in Dec. 2015. For a breakdown of some pawsible rules around, see the linked post, or the ADA. Drivers really can’t pry too closely. Paul was mad because the passenger falsely reported him to Uber for declining a service dog, and as a warning to other drivers in the area, Paul posted the passenger’s photo and a description of the incident to a forum. The stakes of passenger accusations are high. When drivers face accusations, scams, or mistreatment from passengers, they risk being deactivated and losing access to their livelihood. Paul says he was deactivated as a result of the complaint, and reactivated again after he submitted his version of events (and proof) to Uber Support. Drivers can be penalized for passenger complaints, even if they are under-verified, which generally nudges them to absorb the cost of bad passenger behavior. I’ve noticed an uptick recently in forum posts of passenger pics and videos, though dash-cam issues have been on my radar for years. Larry, an interviewee from 2015–2016, worked near Austin, Texas. He reported that, “Once I had driven some guy somewhere and as soon as I got home I had checked and Uber had cut the pay in like half because the guy claimed I took him on an inefficient route, so I sent Uber the footage of the entire trip and I explain to them that if you watch the video he actually directs me turn by turn, you know, where to go, and it’s the most drunk he’s ever been. They reversed them, and gave me back my money. . . . Uber will always 100% go with the customer because that’s how they make business. But I don’t think that should come out of the driver’s pay, because it’s just customer satisfaction.” Not all footage drivers collect is posted online, but dash-cam footage can be a useful tool for accountability in an environment where drivers perceive their position is precarious. Not all drivers have dash-cams, of course, so general passenger awareness of dash-cams and their privacy implications is unlikely to be universal, or universally relevant. Copy from Uber Seattle website. Certain ridehail business practices directly contribute to the adoption and usage of dash-cams by drivers. For example, it is against Uber’s Terms of Service (ToS) for drivers to take unescorted minors on a trip, though drivers report it’s not uncommon for unescorted minors to try to use Uber & Lyft. However, Uber recently implemented an Uber Teen program, whereby parents can create Uber Teen accounts for their kids. 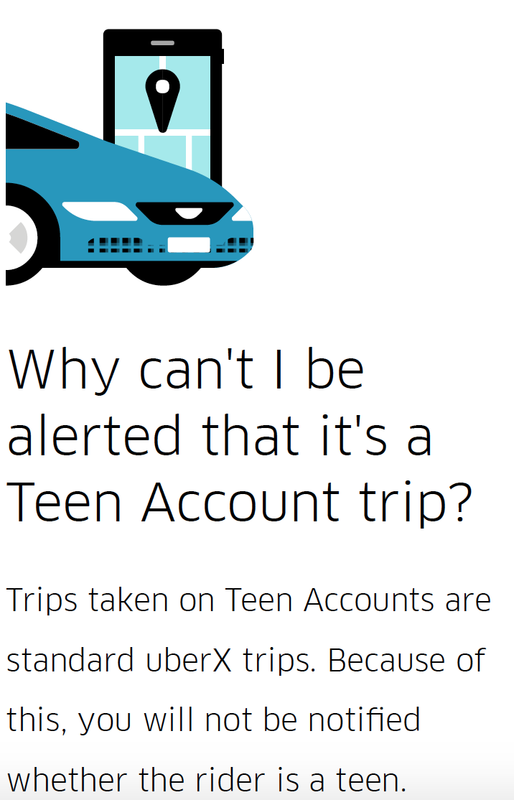 Drivers are not alerted when an unescorted minor who enters their vehicle is, in fact, part of a Teen Account trip. This puts drivers in the precarious position of either violating the ToS, or upsetting the ride requestor. Having proof of their conduct can help them feel better about the whole situation. Drivers in forums and in interviews cite a widespread fear of being falsely accused of sexual misconduct towards passengers, and unescorted minors amplify this fear. By using dash-cams, drivers can at least shore up their side of the story if they do face false allegations. And it’s not just about the kids. Passengers pass out in the backseat from overdoses, drinking, etc., and drivers may have to alert the cops to come retrieve them. When they do, they may need to explain why a limp human is keeled over in their backseat. Photos of passed-out passengers also circulate in forums, though. 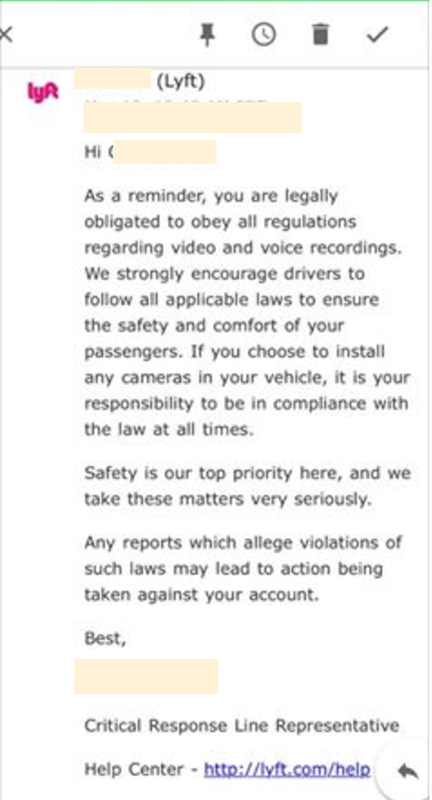 A note one driver received from Lyft after a passenger complained about his dash-cam. *all names + some details are changed for anonymity.